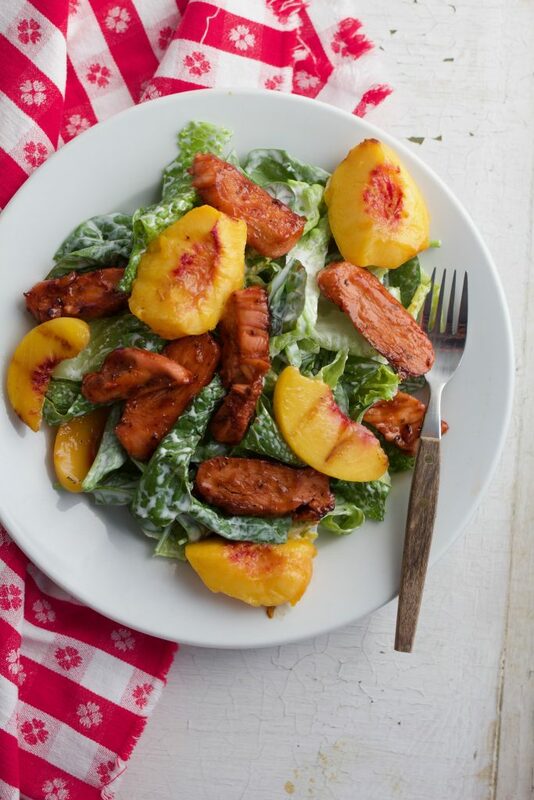 Grilled Chicken and Peach Salad with Caramelized Barbecue Sauce is perfection in a summer salad! Hearty enough for a big appetite, and light enough for those days when you just want a good salad for dinner, this dish is sure to be on your most requested list of recipes to make! The summer of 2017 brought lots of delicious food memories: Apple, Feta and Spiced Pecan Salad with Poppyseed Dressing, Baked Beans with ham and Peppers, Perfected Peanut Butter Bars , Southern Buttermilk Pancakes, and Chili, Lime and Garlic Butter Spread for corn on the cob to name a few. It’s only fitting that we finish off the summer with a recipe that celebrates everything summer: fresh, grilled, quick and easy. 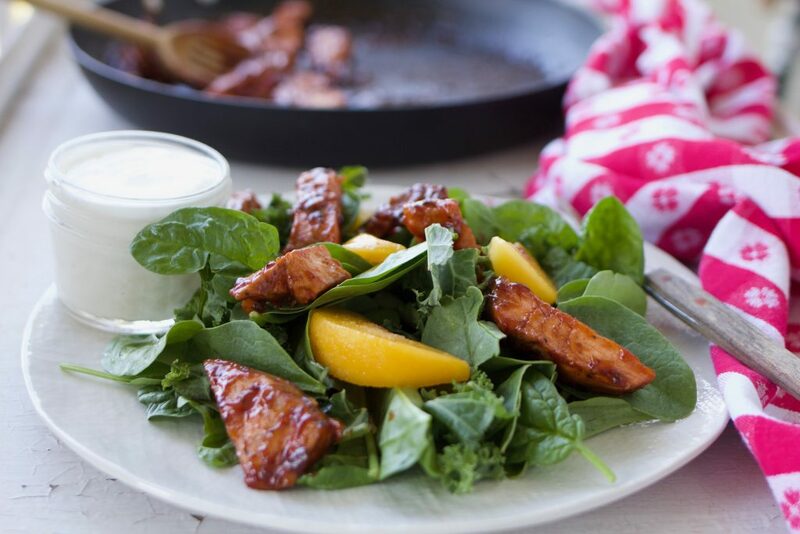 Today, I’m teaming up with Traeger Grills to bring you this amazing Grilled Chicken and Peach Salad with Caramelized Barbecue Sauce! After our discussion, I did what any good detective would do and asked the server how the chicken was prepared. She confirmed that it had been barbecued first, then sliced and cooked again in a pan of caramelized bbq sauce. Ah-Ha! Brilliant. 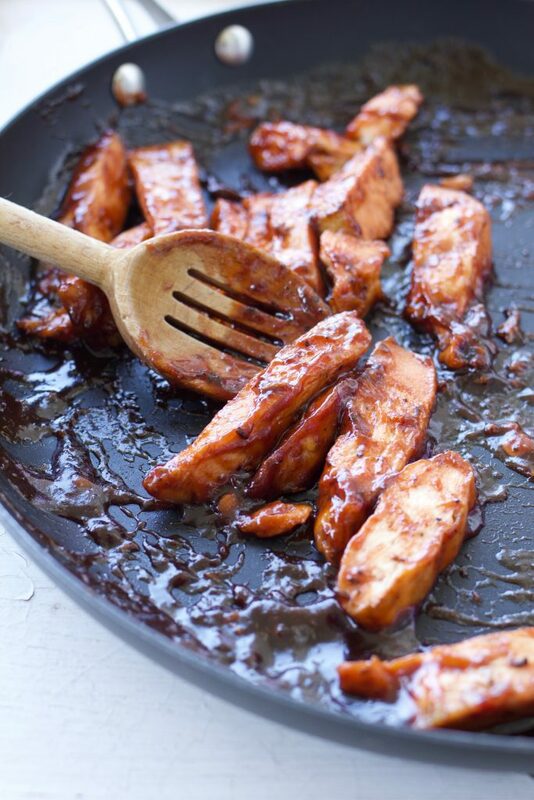 The caramelized bbq sauce coats the chicken in a way that dousing with extra sauce simply won’t. It also gives the chicken a soaked-in-sauce appearance. No white meat edges showing! I know you’re going to love this salad with three basic components: grilled meat and fruit, chopped lettuce and a creamy fresh herb dressing. 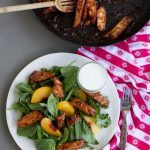 When I returned home, I knew I had to recreate the Grilled Chicken and Peach Salad with Caramelized Barbecue Sauce from Eat Chow. It had been playing over and over again in my head, like that 45 hit record you played so many times back in the 70’s on your little brown turntable that you wondered if it was possible to wear that record out. A few weeks before I ate this salad, we had a Traeger Grill delivered and set up at our home. A Traeger Grill is a grill like no other grill I’ve ever owned. Hardwood pellets (sold in 9 different flavors) are ignited in a fire pot that is temperature controlled and cooks using convection-style heat. The heat cooks food evenly and also encircles food with flavor filled smoke. Did I tell you I’m in love with my Traeger Woodfire Grill?! I am. 1. I’m a little impatient when it comes to grilling. There, I’ve said it. Just a little. Impatient. 2. Temperature control. Even though most bbq’s have a temperature gauge, the temperature fluctuates so much that its really difficult to control! One minute its 275, then next its 475. The Traeger Grill solves this problem! Set the temperature and it’s like using an oven. With a lot of lovely smokey flavor infused. I am amazed at the steady control of the temperature when using the Traeger Grill. The first time I used it, I ran outside about 600 times to make sure the grill wasn’t overheating. Every time, the temperature was exactly where I set the control. Steady temperature equals no more scorched or dried out meat! The Traeger solves the issue of grease dripping onto the flame and then further igniting the flame, which causes meat to burn. Hallelujah. Take a look at my chicken after cooking at a steady 350 for about 40-45 minutes. Perfection. Forget about buying this grill for Dad, get yourself one. You’ll love it. 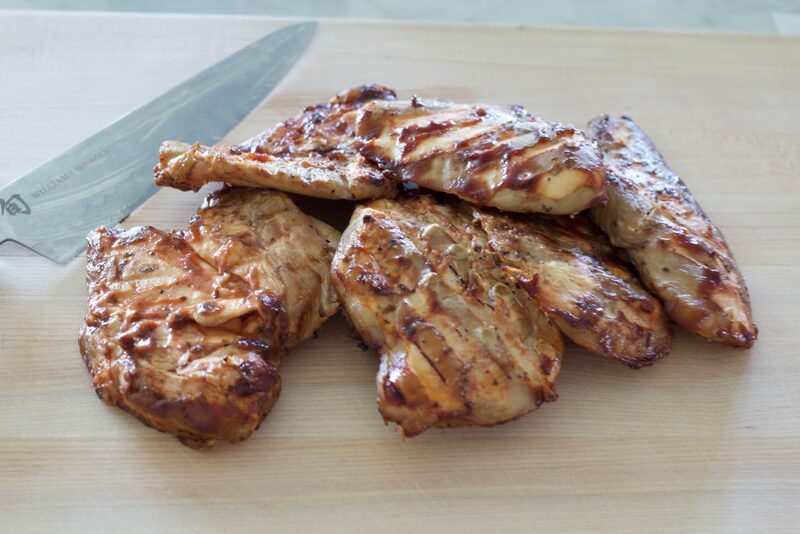 Apply the bbq sauce to the chicken the last 15 minutes for the perfect glaze and avoid scorching the sauce. Use the sweeter flavored Traeger pellets such as apple or cherry to complement dishes. Make extra grilled fruit for a simple dessert! Kristin is a master of the grill and I also love her workout videos found here. Kristin and I are planning on teaching class together at Traeger in SLC. Stay tuned, we will be announcing a class giveaway soon! Hope you love this salad and the unique way the chicken is coated in bbq sauce. 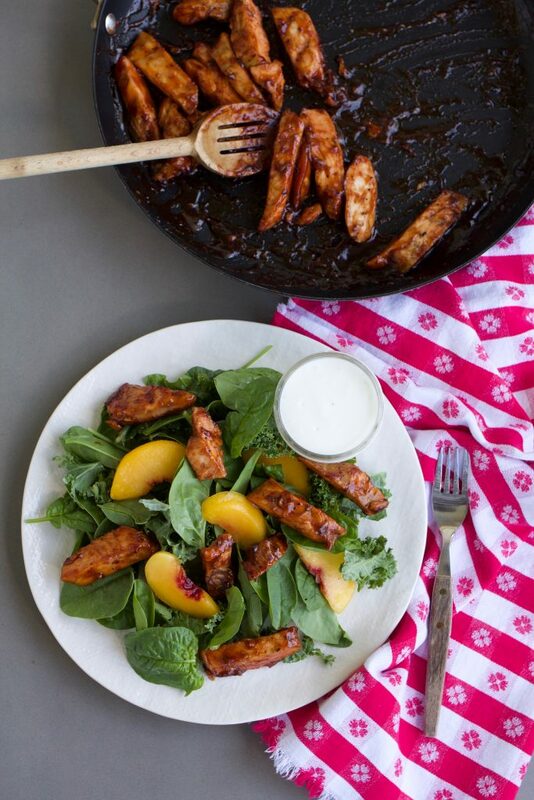 Grilled Chicken and Peach Salad with Caramelized Barbecue Sauce is a meal I will be making over and over again! Up to two days before, or while cooking chicken, make dressing by placing buttermilk, Greek yogurt, herbs, garlic clove, vinegar and salt and pepper in a bowl or jar. Whisk ingredients until smooth using an immersion blender or a wire whisk. Set in fridge until ready to use. Wash Romaine lettuce, spin and rough chop. Refrigerate until ready to assemble salad. Start the Traeger grill on Smoke with the lid open until the fire is established (4 to 5 minutes). Set the temperature to 350 degrees and preheat, lid closed, for 10 to 15 minutes. Place seasoned chicken on grill. Cook for about 20 minutes each side, or until internal temperature has reached 165 degrees. The chicken should be turned once in the grilling process. About 10 minutes before the chicken is done, brush with bbq sauce or glaze and place peach or nectarine slices on grill. Do not coat the fruit slices with bbq sauce. Grill fruit for last ten minutes with chicken. 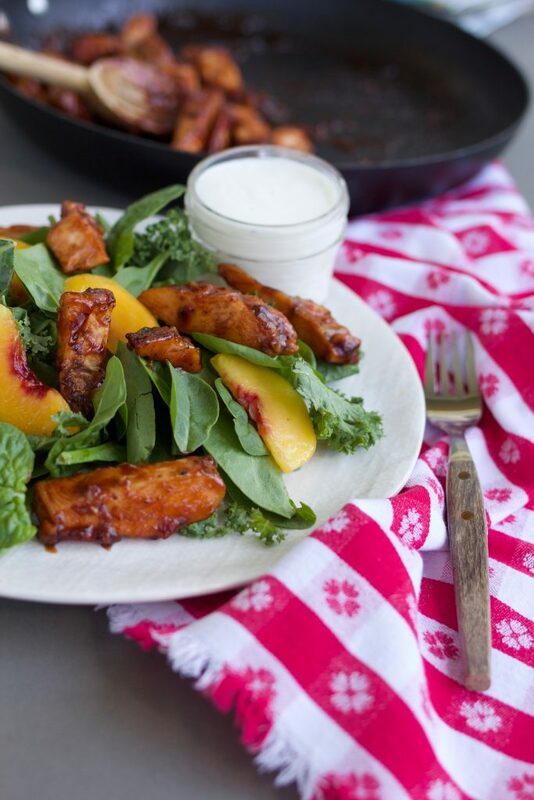 Remove chicken and peaches from grill and set aside. Cut chicken in to slices and set aside. Place about 1/2-3/4 cup of bbq sauce or glaze in a saucepan. Heat the glaze until bubbly over medium high heat. Place cut up chicken in sauce, using tongs or two spatulas, turn the chicken until coated completely in sauce. Let the chicken sit in the caramelized sauce on stovetop for about 1-2 minutes, util completely coated and bbq sauce is sticking to chicken. Remove from heat and set aside. Toss the lettuce with about 1/3 cup of salad dressing in a large bowl. Plate the salad on individual plates, lettuce first, then top with grilled chicken and peach slices. Serve immediately and pass around extra salad dressing. -I use 1 large head of Romaine for this salad, which yields anywhere from 15-20 cups of chopped lettuce depending on the size of the head of lettuce. -You may use your own bbq sauce store bought, or home made. I have a few different sauce on A Bountiful Kitchen , use the search bar for bbq sauce or barbecue sauce. For testing purposes, I used Traeger Grills newest "Sugar Lips" Glaze for this recipe. 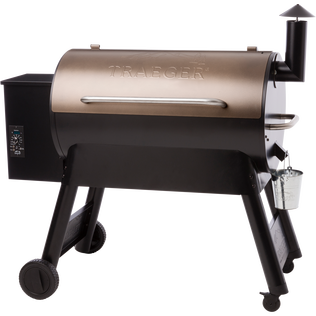 Thanks to Traeger Grills for sponsoring this post! 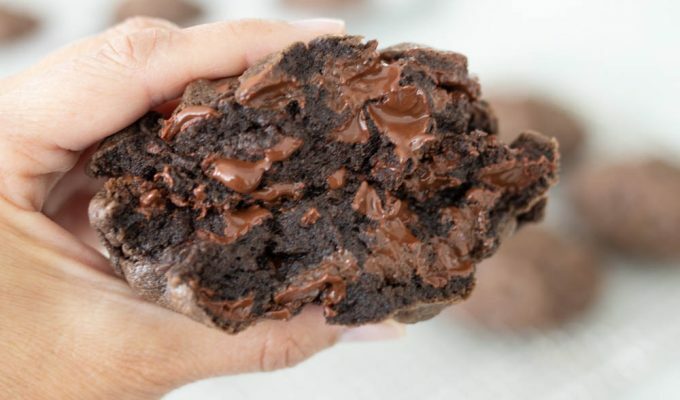 Nice, thanks for the sharing delicious recipe am also read read your recipe but this one of the most delicious and yummy. i will make it. Amazing…! your dish looks so yummy and delicious this is one of my favorite recipe till now. Thanks for the sharing and keep shared your new ideas and recipe….! Thank you! I love the fruity flavors with the tangy barbecue sauce. I’ve been searching for a simple grilled chicken and BBQ sauce recipe. Until now, I had only been finding ones where the overwhelming ingredients list made me feel to go back to store. Can’t wait to try it!